I was pleasantly surprised by the generally wonderful food I ate during a recent lunch at Marcus Wareing’s plush premises, which still retain the refrain of red Bordeaux from their previous proprietor’s rein. Nearly every dish was unabashedly redolent with robust & clearly delineated flavors that sang on the palate, while service was professional & well-meaning. Sure, the backdrop may be a bit dated & smack of economic excesses; and yes, the clientele seems to fit a particular stereotype, but the food certainly makes the attractively priced prix-fixe lunch tempting. And once you’ve had that, you might be tempted to explore further should your purse strings be flexible enough to cope. It’s not the most exciting or trendy restaurant in London right now, but the cooking certainly sets the bar high. I had been in London for a week, mostly for what turned out to be an exceedingly stressful and long week of work. However, after visiting Mrs. LF’s family in France on our second weekend in Europe, and returning to London with two days off before heading back to the US, I was looking forward to some relaxation, and hopefully a good meal…or two. The day after our arrival the weekend prior, we had the good fortune to dine at the chef’s table of Heston Blumenthal’s new restaurant, and his first in London. I hope to post about that meal next, as we had a great time – Baby LF included – and generally enjoyed the food. 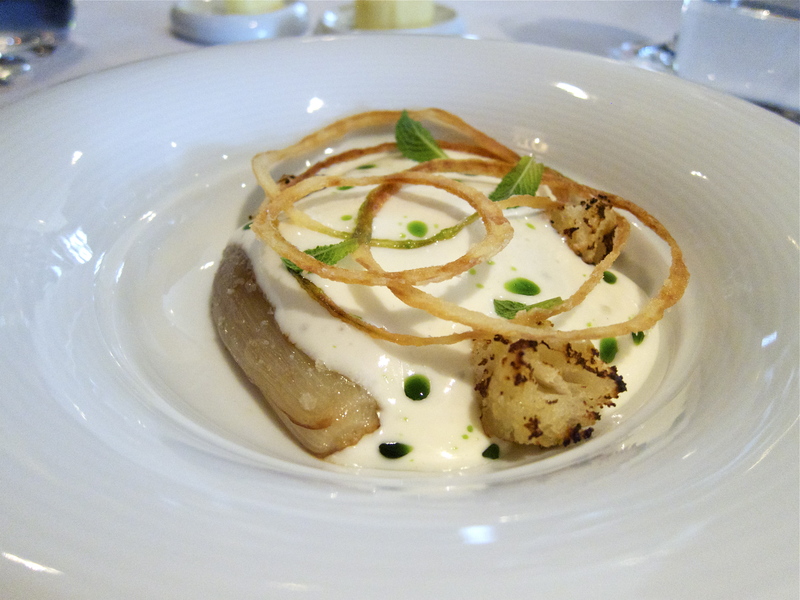 My only other fancy meal for the trip was originally supposed to be at Pied à Terre, the dual Michelin star stalwart on Charlotte Street, at which I enjoyed a meal with my parents a number of years ago. However, with news that its head chef Shane Osbourne was to be departing rather soon, my dining colleague and I decided it might be more fun to try somewhere else. In fact, in planning my London trip, I had originally thought about trying the seemingly good value prix-fixe lunch menu at Marcus Wareing at The Berkeley, despite the fact that I have never been a great fan of the current name adorning the restaurant’s masthead. Having never met the man in person or tasted his food, ‘who am I to judge anyway’ is a fair enough question. I guess I have just never liked the way he comes off on camera, or in press comments/interviews, or through accounts of him from people I know. However, I was informed by my partner in crime that the kitchen’s current head chef was definitely a talent (formerly holding the position of sous-chef at noma in Copenhagen) and, as I had always wanted to see what all the fuss was about anyway, it seemed like a grand idea – or at least a grand setting. If you enter the hotel from Wilton Place, just off Knightsbridge, you head straight to your right, through an open and pleasant informal dining space. Once through this area, two doors stand before you, they are opened (of course you would not open them yourself at a 5-star hotel), and you enter a fairly intimate rectangular dining room. As I was the first one to arrive, I was seated on a cushioned bench at one of the three squat tables that serve as the waiting area, and I must admit I felt rather awkward on my own seated next to two smartly dressed older couples who were enjoying aperitifs and some nibbles before taking their proper seats. After fiddling with my phone for a bit, I was about to order some Champagne as this seemed to be what one should do (and I never say no to some good Champagne), but my partner in crime arrived just in time to prevent a minor fleecing of funds from my wallet. As you would expect, the dining room tables were traditionally and faultlessly appointed, with perfectly ironed linen, fancy napery and so on and so forth. 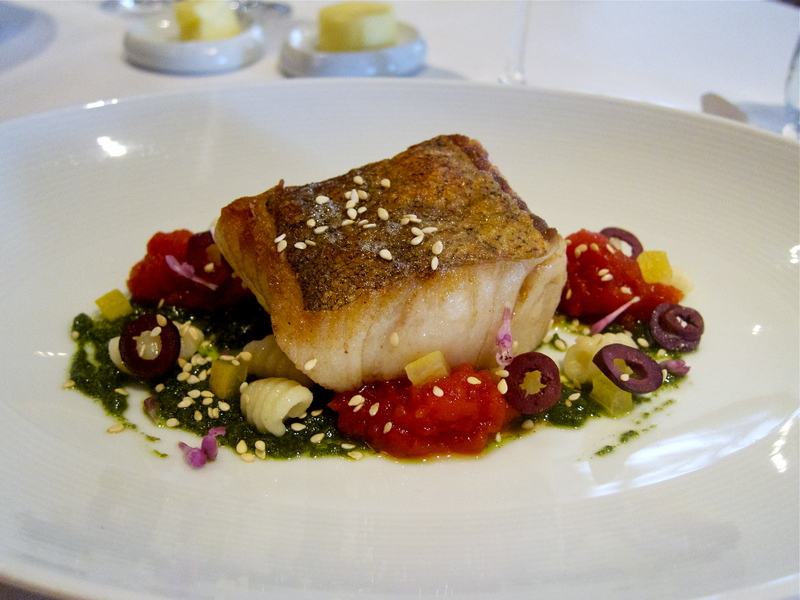 As many UK readers will know, this restaurant was formerly called Petrus, and was run by Gordon Ramsay Holdings before Marcus and Gordon went their separate ways in not such an amicable fashion. Ramsay recently, and rather ridiculously if you ask me, opened a new restaurant of the same name not that far away from the original one. Old habbits, and aging egos, die hard it would seem. 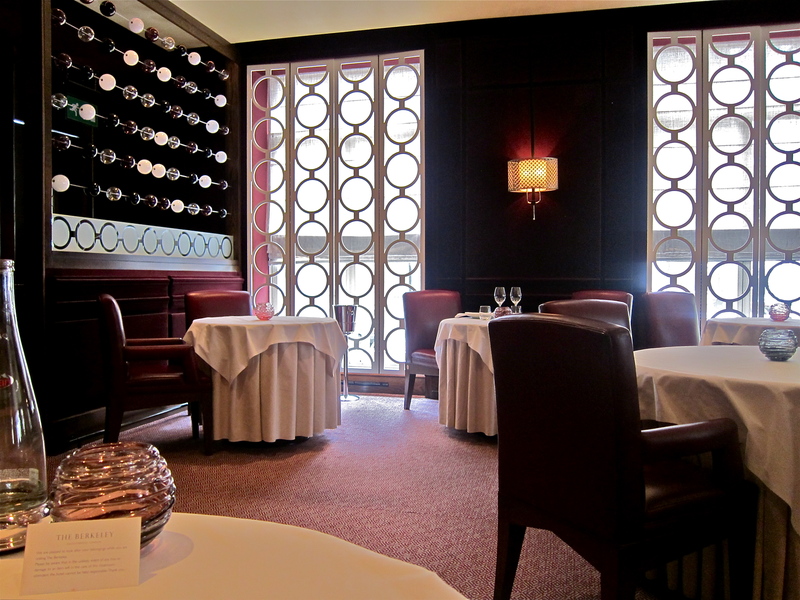 In any case, the dining room that David Collins designed in 2003 for the original Petrus remains largely the same so far as I could tell, with rich claret being the color of concentration. The metal gridding adorning the windows is reminiscent of a wine rack, reinforcing the theme. Tables are very well spaced, and parties of two are seated at four and eight o’clock. It is a formal room and most of the guests on the day we dined were probably over 50 and all very well turned out. I wondered if the food would be as traditional as the setting. We were presented with a number of menu options, but in the end decided to go with the prix-fixe menu, which gives you two options for starters and mains and three choices for desserts, plus the amuse bouche(s), pre-dessert and petit fours that you expect at a restaurant that is catering for an inspector or two from a particular tire company. All in all, I thought it was pretty good value at £38 if the cooking would hold muster, and even better at £50 with a wine pairing thrown in. In order to be completely transparent, for one reason or another – either because of our photo snapping or because of the name on our reservation – we did receive a few extra courses, which we had not asked for and for which we were not charged (these were: starters 1 and 3, which came with accompanying wines, plus possibly an additional pre-dessert). First out of the kitchen was a warm and delectable little morsel. 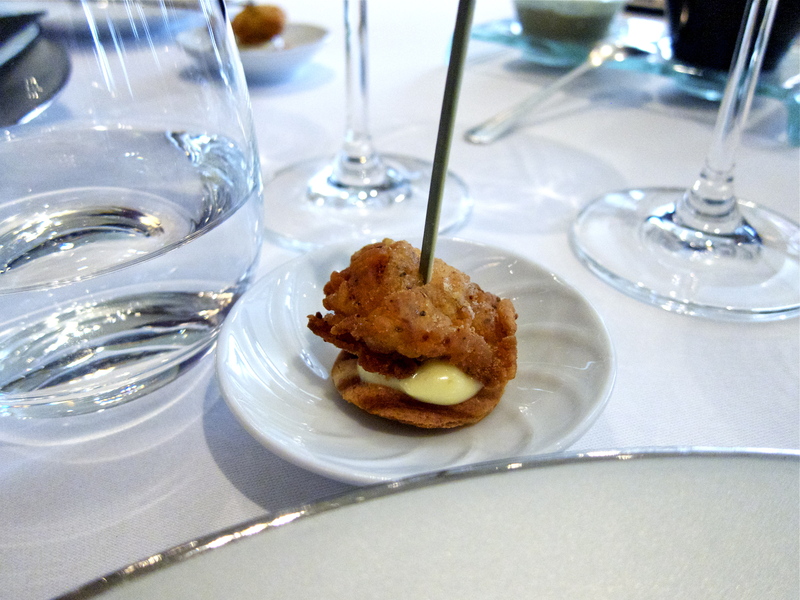 The textures of crispy chicken skin and soft waffle were appealing, with a slight trace of good poultry flavor and an excellent creamy mustard giving it some verve. If someone in America’s Deep South tried to distil some of the classic dishes from that region into a refined party canapé, this quite possibly would have been the result. One of my dirty kitchen secrets is that I quite enjoyed a particular supermarket’s tub of taramasalata when I lived in the UK. Slightly pink, creamy and salty, it always did the trick for a quick no-hassle snack. 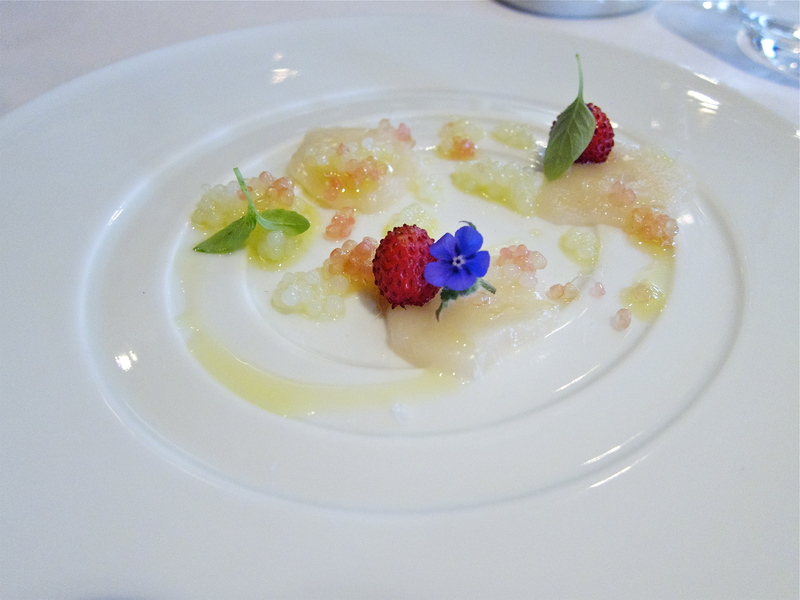 This version, besides being extremely beautiful to look at – with the micro herbs and delicate radish slices – was miles removed from the commercial stuff. 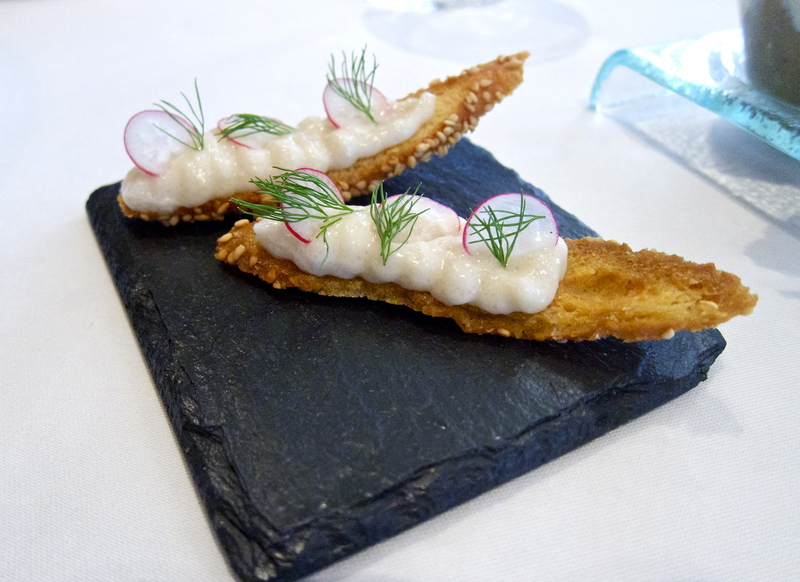 It was definitely the best taramasalata I have I’ve ever had, including versions from well-known Mediterranean restaurants and a few home kitchens. Another extremely refined nibble that was not shy in the flavor department. Sticking with the Mediterranean theme, we were given some more crisp melba toast in a basket, with a wonderful dip of eggplant and mint yogurt, which was quite ambitiously salted, but this worked due to the creaminess of the yogurt and the faint sweetness of the mint. I was surprised with all three canapés as I had expected to be served very traditional French or British foods at the restaurant, and we had already been flown to the South of the USA and back to Greece. I was wondering what would come next. I would give this opening trio of snacks an 8/10 as they were bursting with flavour and pretty original, at least within this context, and compared to my expectations. 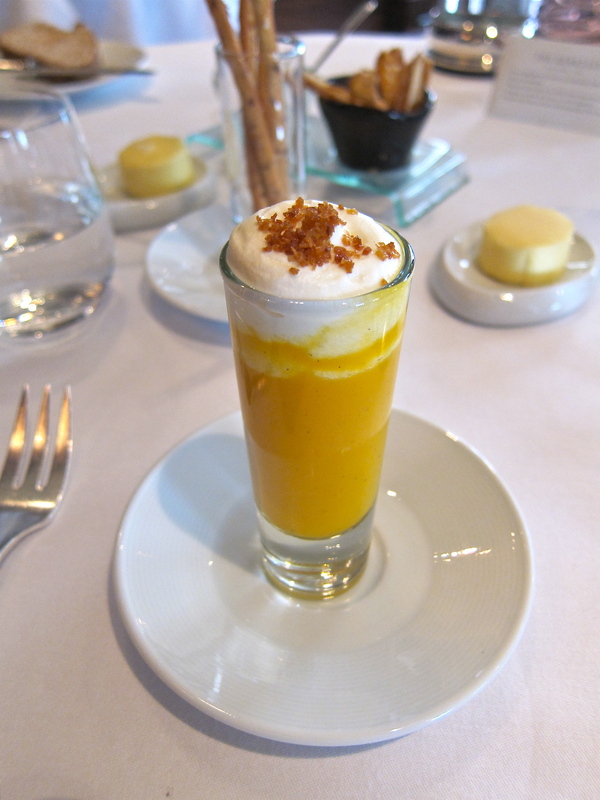 Our next course came in a narrow glass that contained what appeared to be some sort of deep orange milkshake, replete with whipped cream and toppings. It was in fact a butternut squash soup, which had a lovely creamy texture and was perfectly seasoned. The slightly sweet accent from the froth on top and the spice of ginger elevated this dish to live up to its appetizing presentation. Another strong dish, another 8/10. We both received the next dish which, in my opinion, was one of the more beautiful plates I have had the pleasure of looking at in while. Luckily, the taste again lived up to the promise of the presentation. This dish was all about the sweetness of the Scottish scallops being married to the bright acidity and tang of the finger limes and lemon vinegar. Some additional sweetness was provided by dainty wild strawberries and a few sprigs of Thai basil. This cold plate warmed my heart and reminded me of my frozen plate of sea urchins at noma a few months prior (possibly because of the connection between the Orkney Islands and the lone Scotsman who caught the sea urchins at the Northern tip of Scandinavia). 9/10. Next came the starter I had actually ordered from the menu. This was pure genius and not at all what I had been expecting to find at a ‘fine dining’ restaurant. It was probably not such an expensive dish to put together, but its rich flavors proved you don’t need fancy ingredients to make something taste amazing. The shallots had been beautifully cooked and were hence exceedingly sweet. This allied well with the smokiness that ran through the dish, from both the cheese and the char on the potato bread. The yogurt was excellent, as it had been in our canapés, and the mint – which arrived in both liquid and leaf form – not only added a pretty visual accent, but a significant layer of flavor too. I almost licked my plate clean. 9/10. Another unannounced dish was presented shortly thereafter, and this one was also a looker. 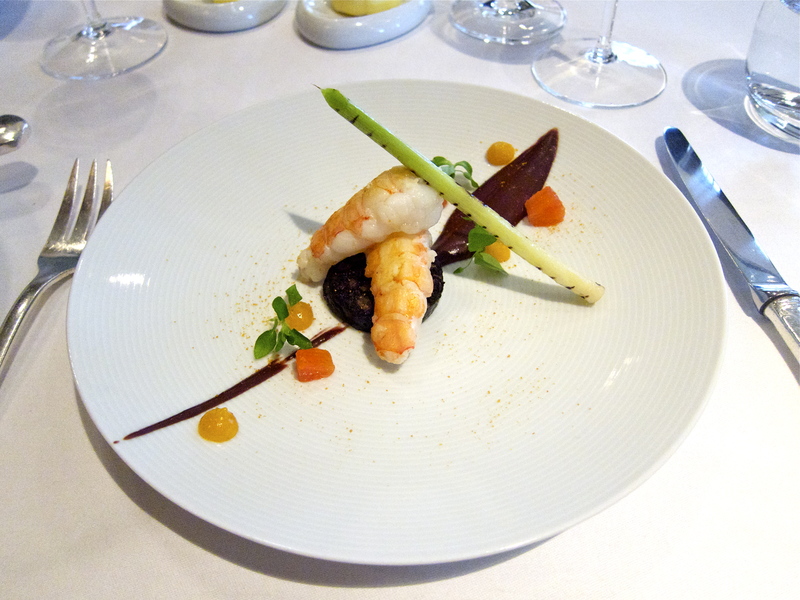 A classic combination of black pudding and langoustines was executed very well, but it was again the minute but flavorful accents that set this above other versions that I’ve had of this pairing. Besides its citrus notes, the blood orange added good acidity to cut through the sweetness of the langoustines and the richness of the black pudding. The langoustines were very close to the texture and sweetness of the ones I had at noma, and they were cooked very well, retaining their moisture and soft texture. 8/10. Unfortunately, one of the two dud notes in this thus far edible symphony was my main course. I have had Pollock a few times before, and it has never been my favorite of fishes, but I thought in such a kitchen they might be able to elevate this humble craniate to new heights. Sadly it was not to be. The fish itself seemed a little too dry to me, and it just didn’t have much flavor. The same couldn’t be said of the accompaniments, which were actually excellent…on their own, that is. I really enjoyed the robust flavors that came from the green nettle (mimicking pesto in texture), the particularly sweet tomato (did they add a sweetening agent? ), some bittersweet preserved lemon and purple olives. The homemade pasta they came with was first-rate too, cooked as al dente as you’d get in a proper Italian restaurant. So if it had just been a bowl of pasta with sauce, great, but unfortunately the fish and the rest of it just didn’t integrate at all and I almost didn’t see the point in finishing the fish itself. 6/10. Our waiter asked us if we would like a tour of the kitchen as we waited for our desserts, and we certainly had no reason to decline. It turned out Marcus was not in the kitchen – I would guess he was in St Pancras Renaissance Hotel at the then soon-to-open (and now opened) The Gilbert Scott, his second London restaurant – but his head chef, James Knappett (who is on twitter, by the way), was present and had a lot of interesting things to say. I think the three of us actually ended up talking for nearly half an hour, and we learned a lot about the restaurant’s extremely high quality of sourcing of ingredients, plus the serious effort they put into making as many things as they can in the kitchen from scratch (including all of the pastas, for instance). 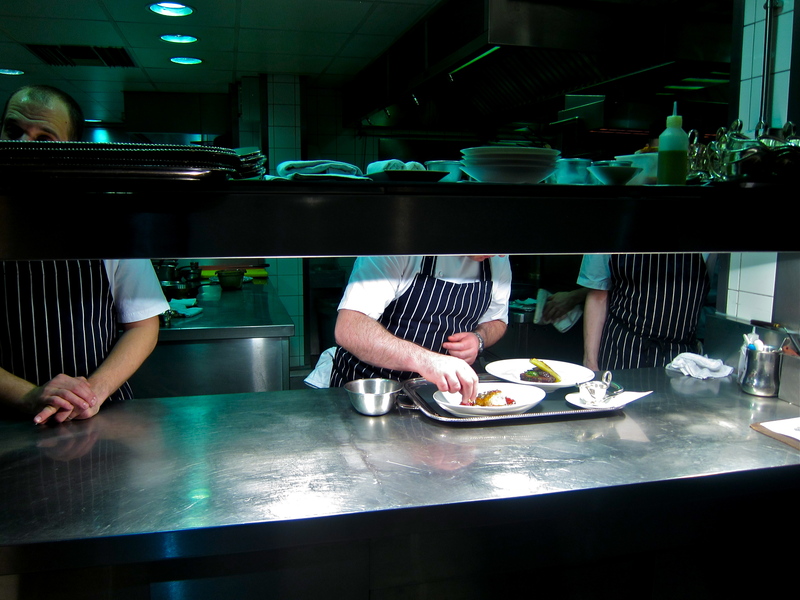 It was also great to see them finishing all of the plates going out at the pass. After our seventh-inning, and eight-course stretch, we returned to our table, where we were met with another delight. 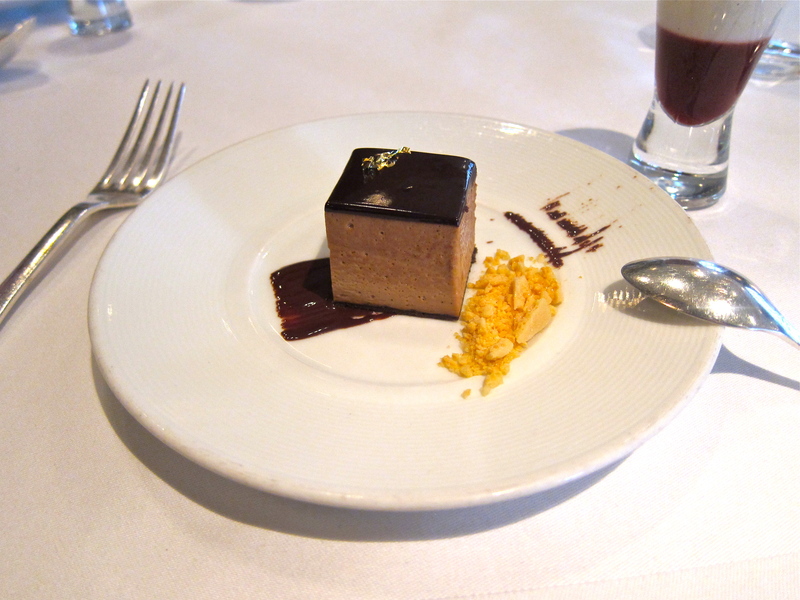 I am not sure exactly what this creamy cube of a cake was called, but it was delicious, with a decadent dark chocolate layer on top, and some crumbled honeycomb whose crunchiness and mellow sweetness worked perfectly with it. 8/10. 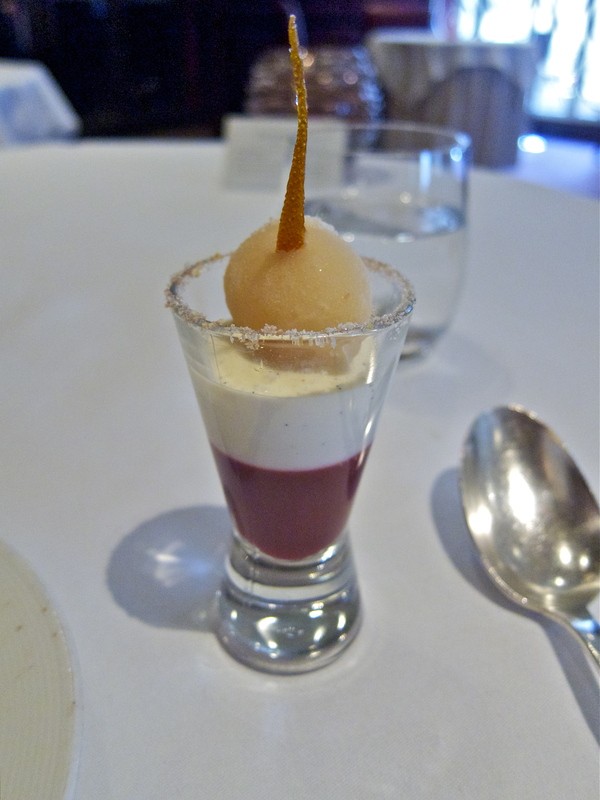 Given my current city of work, it was a shame that the other real shortcoming in my meal was the ‘Manhattan’ pre-dessert. I really can’t recall much about it except that both my dining partner and I didn’t like it at all. It was a shame considering it was quite an attractive little glass. I prefer not to score this as, if I did, it would probably be around a three and disproportionately bring down the score for the overall meal. My strong reaction to it was probably due to my dislike of the flavors inherent within the glass (I remember something like blackcurrant and/or kirsch, neither of which I care for much). We both ordered an evolved version of Marcus’ Wareing’s now classic British dessert, which originally made it through to the final event in the first series of The Great British Menu television, and, and was served to HRH herself. I didn’t fall in love with it, but I did enjoy most elements of the complicated plate, with its pink, creamy Hershey kisses, candied rhubarb, crispy crumbs and ice cream. The custard tart itself was very good, but I thought there was too much going on otherwise – it all seemed a sideshow, a distraction. 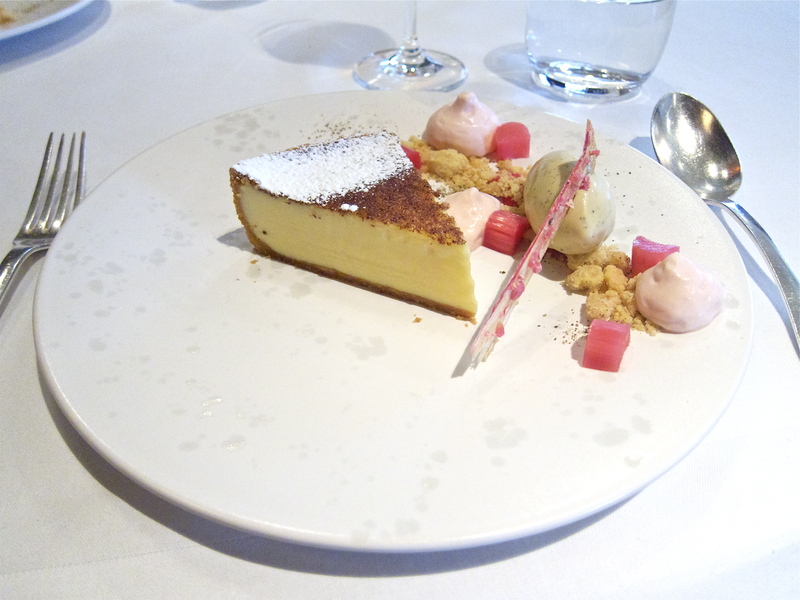 The flavour of black pepper did come through very strongly, and I had mixed feelings about how this interacted with the sweeter-than-expected rhubarb flavour and the firm custard itself. I think the original version may have been better, though I never tried it. I would personally pare this down a bit more, at least presentation-wise. 6/10. 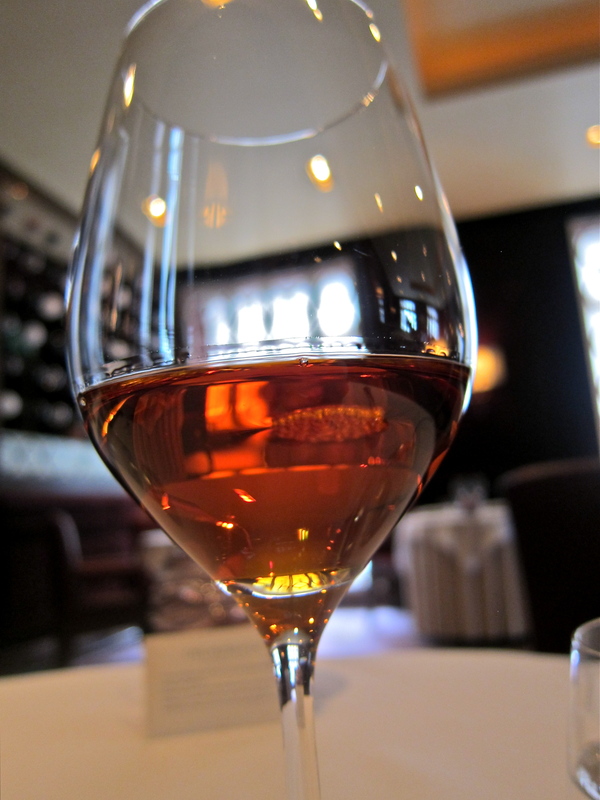 The sommelier recommended a sticky wine from Sardinia to go with dessert and it was pleasant enough though it didn’t get my palate racing. It was also quite aggressively priced, but I couldn’t complain given the extra courses and wines we had been given. As I pointed out at the beginning, my expectations were not very high before our meal, and most of the food we were served far exceeded them. For the most part, each dish had been technically very well prepared, and the unifying theme – as there didn’t seem to be a particular type of cuisine being served – was the fullness of the flavors. 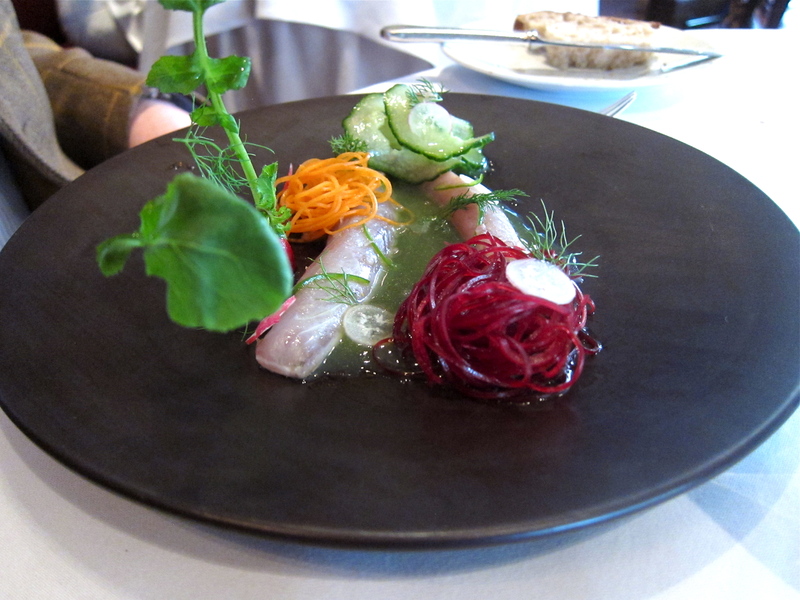 Out of the all the dishes we tasted (and that was a fair many), the only dish in particular seemed lacking in this department was my companion’s starter of mackerel, cucumber, beetroot, carrot, finger lime and chilli. It looked beautiful (see the photo above), but it just didn’t function well as a whole, and was quite bland, with the star of the show – the mackerel – leaving something to be desired. (I must add that his main course of beef cheeks and bone marrow was completely the opposite, with deep flavors that begged to be eaten). The only other thing we both didn’t like was the cute little ‘Manhattan’ pre-dessert, but this is nitpicking. The fact is the food here certainly belongs in a small handful of the best London ‘fine dining’ restaurants. 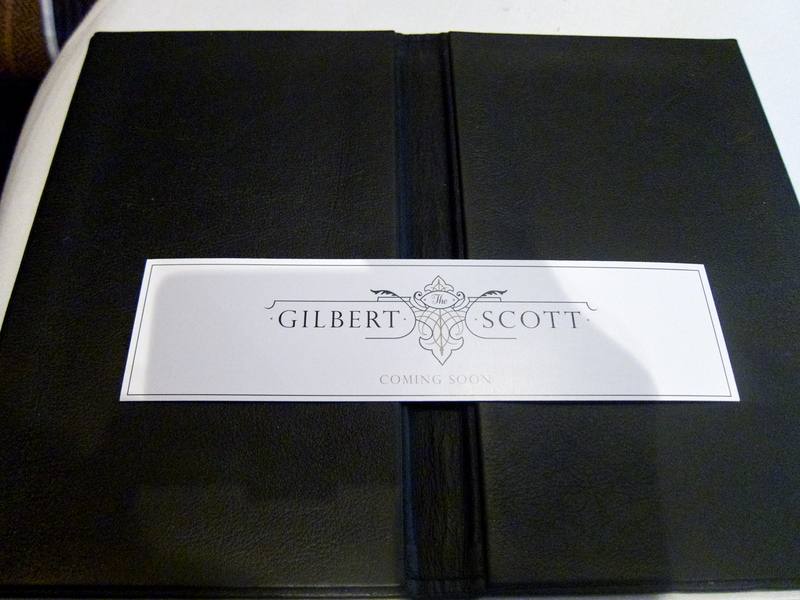 The service throughout the meal, which was delivered by a diverse cast of characters, was generally very good. Besides one person who I think took himself a tad too seriously, everyone was knowledgeable, friendly and professional. The interaction was definitely on the formal side, but this is what you expect at such a venue. If I still lived in London, I don’t think I would be chomping at the bit to return asap, but I certainly would like to explore more of the menu as I think the kitchen is performing at a very high level. And if I had a business meeting or formal occasion to celebrate, this would definitely be one of the places I would consider. I guess this is proof that you can’t always judge a chef by his TV cover(age). Good show. Wine: the wine list is a seriously thick, heavy, leather-bound tome of over 40 pages, which has some great wine from excellent producers. There is a good selection by the glass and half bottle too, although it seems very aggressively priced across the board, with mark-ups of 4 times or so common throughout. You can see a list of the wines we had by the glass that the sommelier chose for the pairings with our dishes. This entry was posted in Finer Fare, Laissez Eats and tagged 2 Michelin Starred Chef, 2 Michelin Stars, Australian Finger Lime, Black Pudding, Bonbon Trolley, Custard Tart, David Collins, Fine Dining, Gordon Ramsay, Gordon Ramsay Holdings, James Knappett, London, Marcus Wareing, Orkney Scallops, Petrus, Pollock, Restaurants, Santadi Latinia, Smoked Goat's Cheese, Taramasalata, The Gilbert Scott by laissezfare. Bookmark the permalink. Great post, LF. 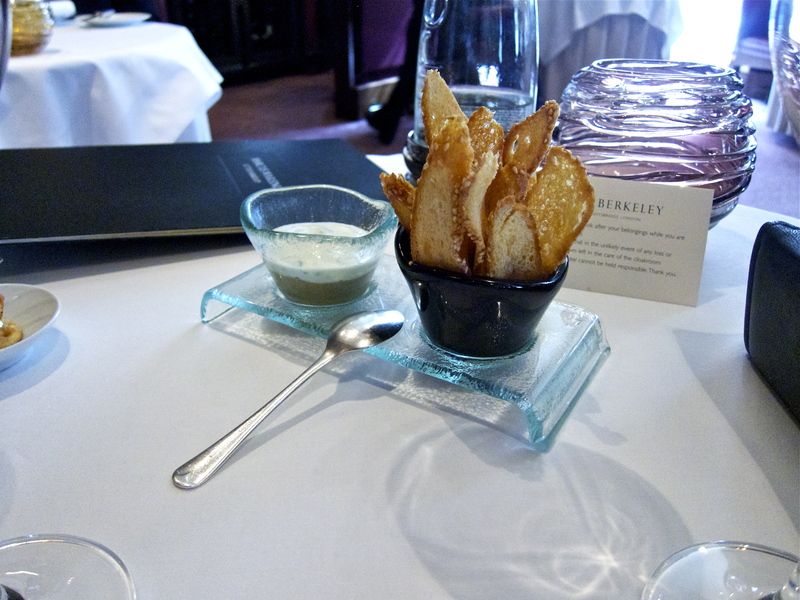 Marcus Wareing at The Berkeley is one of my favourite restaurants in London but it seems to be often over-looked for some reason. 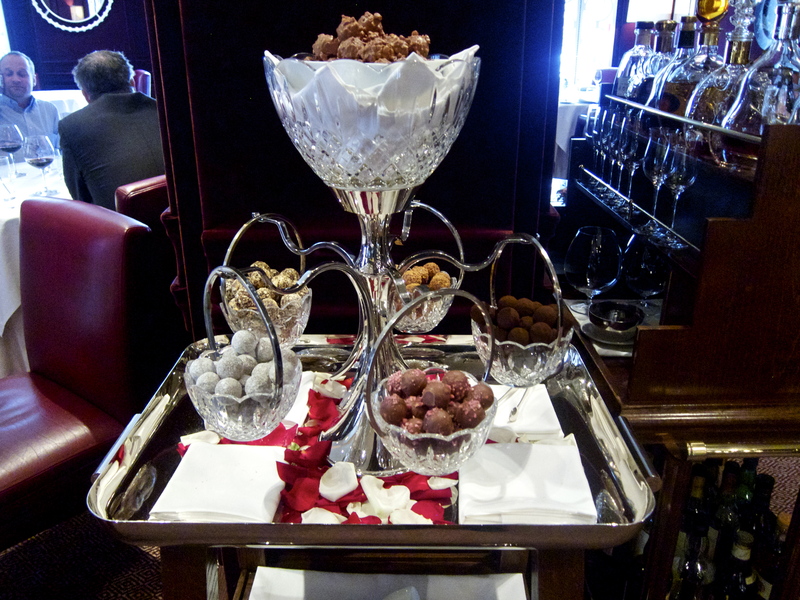 You really should go back for the evening menu, even if only for the bonbon trolley! Thanks very much Emyr. I guess sometimes people are just focused on finding the new-new thing. The food is definitely pretty solid at MW, at least from my one visit. I’ve been wanting to get to Marcus Wareing and should try before I leave. Heard lots of great things and your photos make me drool! Shame about your main course though! It’s worth a try, and like I say in the review, the lunch deal(s) is pretty good. I still can’t figure out how to use my S90 as well as you do, but hopefully I am improving 🙂 When do you go back?